Earlier this week, Apple announced results for fiscal Q4 that were largely in line with expectations. iPhone shipments came in at 33.8 million (26% YoY growth) and iPad shipments were flat at 14.1 million, with ASPs for both product lines also remaining flat. The iPhone shipment figure was particularly interesting as it was just above the 31-33 million range predicted by Google trends. 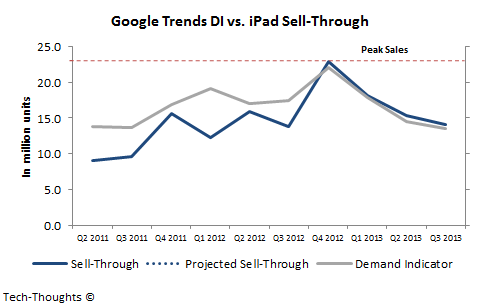 Since Google trends is primarily a demand forecasting tool, I thought it would be more prudent to compare it to iPhone and iPad sell-through and not shipments. As I had previously explained, Google trends' data is a leading indicator for iPhone sales, i.e. 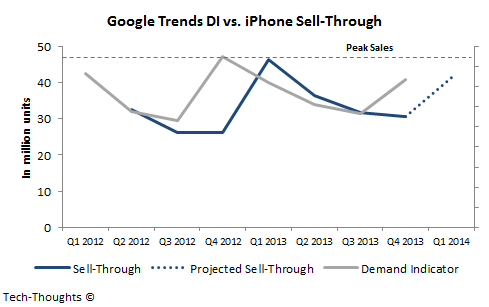 the Google trends demand indicator in one quarter predicts iPhone sales in the next quarter. As the chart above shows, this fit is quite accurate for quarterly figures, if not weekend sales. For the most recent quarter predicted iPhone sell-through of 29.5 million compares favorably with actual sell-through of 30.5 million. As I had pointed out in my iPhone bear case, the demand indicator for fiscal Q1 2014 (calendar Q4 2013) shows a strong YoY decline, projecting a sell-through of ~43 million units. 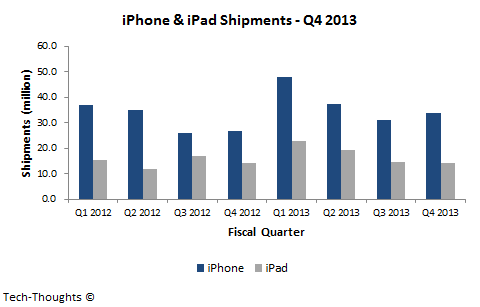 This should translate to ~45 million shipments compared to 47.8 million shipments (sell-through of 46 million) in Q1 2013. Of course, it is unclear how the addition of China Mobile and the accelerated roll-out schedule for the iPhone 5S/5C would affect this figure. 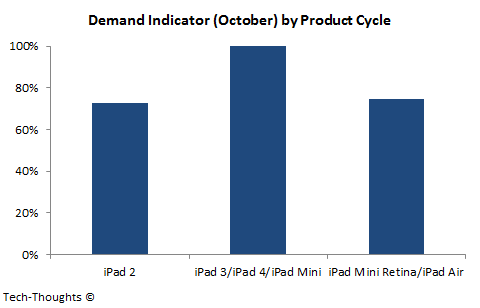 October demand for the iPad seems to about 25% lower than last year (iPad Mini/iPad 4 launch) and roughly comparable to 2011 (even though the iPad 2 was launched in March). Of course, this is only one piece of the puzzle and Christmas demand could always be higher. I will continue to track this data on a periodic basis and update my estimates as we hit key milestones.